Fayetteville (/ˈfeɪətˌvɪl/) is a city in Cumberland County, North Carolina, United States. It is the county seat of Cumberland County, and is best known as the home of Fort Bragg, a major U.S. Army installation northwest of the city. Location in Cumberland County and the state of North Carolina. Fayetteville has received the All-America City Award from the National Civic League three times. As of the 2010 census it had a population of 200,564, with an estimated population of 204,408 in 2013. It is the 6th-largest city in North Carolina. Fayetteville is in the Sandhills in the western part of the Coastal Plain region, on the Cape Fear River. With an estimated population in 2013 of 210,533 people, the Fayetteville metropolitan area is the largest in southeastern North Carolina, and the fifth-largest in the state. Suburban areas of metro Fayetteville include Fort Bragg, Hope Mills, Spring Lake, Raeford, Pope Field, Rockfish, Stedman, and Eastover. Fayetteville's mayor is Mitch Colvin, who is serving his first term. The area of present-day Fayetteville was historically inhabited by various Siouan Native American peoples, such as the Eno, Shakori, Waccamaw, Keyauwee, and Cape Fear people. They followed successive cultures of other indigenous peoples in the area for more than 12,000 years. After the violent upheavals of the Yamasee War and Tuscarora Wars during the second decade of the 18th century, the North Carolina colony encouraged English settlement along the upper Cape Fear River, the only navigable waterway entirely within the colony. Two inland settlements, Cross Creek and Campbellton, were established by Scots from Campbeltown, Argyll and Bute, Scotland. Merchants in Wilmington wanted a town on the Cape Fear River to secure trade with the frontier country. They were afraid people would use the Pee Dee River and transport their goods to Charleston, South Carolina. The merchants bought land from Newberry in Cross Creek. Campbellton became a place where poor whites and free blacks lived, and gained a reputation for lawlessness. In 1783, Cross Creek and Campbellton united, and the new town was incorporated as Fayetteville in honor of Gilbert du Motier, Marquis de Lafayette, a French military hero who significantly aided the American forces during the war. Fayetteville was the first city to be named in his honor in the United States. Lafayette visited the city on March 4 and 5, 1825, during his grand tour of the United States. 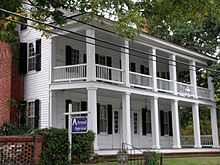 The Cool Spring Tavern, built in 1788, is the oldest structure in Fayetteville. Most earlier structures were destroyed by the "great fire" of 1831. The local region was heavily settled by Scots in the mid/late 1700s, and most of these were Gaelic-speaking Highlanders. The vast majority of Highland Scots, recent immigrants, remained loyal to the British government and rallied to the call to arms from the Royal Governor. Despite this, they were eventually defeated by a larger Revolutionary force at the Battle of Moore's Creek Bridge. The area also included a number of active Revolutionaries. "This obligation to continue in full force until a reconciliation shall take place between Great Britain and America, upon constitutional principles, an event we most ardently desire; and we will hold all those persons inimical to the liberty of the colonies, who shall refuse to subscribe to this Association; and we will in all things follow the advice of our General Committee respecting the purposes aforesaid, the preservation of peace and good order, and the safety of individual and private property." Robert Rowan, who apparently organized the group, signed first. Robert Rowan (circa 1738–1798) was one of the area's leading public figures of the 18th century. A merchant and entrepreneur, he settled in Cross Creek in the 1760s. He served as an officer in the French and Indian War, as sheriff, justice and legislator, and as a leader of the Patriot cause in the Revolutionary War. Rowan Street and Rowan Park in Fayetteville and a local chapter of the Daughters of the American Revolution are named for him, though Rowan County (founded in 1753) was named for his uncle, Matthew Rowan. Flora MacDonald (1722–1790), a Scots Highland woman known for aiding Bonnie Prince Charlie after his Highlander army's defeat at Culloden in 1746, lived in North Carolina for about five years. She was a staunch Loyalist and aided her husband to raise the local Scots to fight for the King against the Revolution. Seventy-First Township in western Cumberland County (now a part of Fayetteville) is named for a British regiment during the American Revolution – the 71st Regiment of Foot or "Fraser's Highlanders", as they were first called. Fayetteville had what is sometimes called its "golden decade" during the 1780s. It was the site in 1789 for the state convention that ratified the U.S. Constitution, and for the General Assembly session that chartered the University of North Carolina at Chapel Hill. Fayetteville lost out to the future city of Raleigh in the bid to become the permanent state capital. In 1793, the Fayetteville Independent Light Infantry formed and is still active as a ceremonial unit. It is the second-oldest militia unit in the country. Henry Evans (circa 1760–1810), a free black preacher, is locally known as the "Father of Methodism" in the area. Evans was a shoemaker by trade and a licensed Methodist preacher. He met opposition from whites when he began preaching to slaves in Fayetteville, but he later attracted whites to his services. He is credited with building the first church in town, called the African Meeting House, in 1796. Evans Metropolitan AME Zion Church is named in his honor. Fayetteville had 3,500 residents in 1820, but Cumberland County's population still ranked as the second-most urban in the state behind New Hanover County (Wilmington). Its "Great Fire" of 1831 was believed to be one of the worst in the nation's history, although no lives were lost. Hundreds of homes and businesses and most of the best-known public buildings were lost, including the old "State House". Fayetteville leaders moved quickly to help the victims and rebuild the town. The Market House, completed in 1832, became the center of commerce and celebration. The structure was built on the ruins of the old State House. It was a town market until 1906. It served as Fayetteville Town Hall until 1907. The City Council is considering adapting the Market House into a local history museum. The Confederate arsenal in Fayetteville was destroyed in March 1865 by Union Gen. William T. Sherman during the Civil War. In March 1865, Gen. William T. Sherman and his 60,000-man army attacked Fayetteville and destroyed the Confederate arsenal (designed by the Scottish architect William Bell). Sherman's troops also destroyed foundries and cotton factories, and the offices of The Fayetteville Observer. Not far from Fayetteville, Confederate and Union troops engaged in the last cavalry battle of the Civil War, the Battle of Monroe's Crossroads. Downtown Fayetteville was the site of a skirmish, as Confederate Lt. Gen. Wade Hampton and his men surprised a cavalry patrol, killing 11 Union soldiers and capturing a dozen on March 11, 1865. In the late nineteenth century, Fayetteville whites adopted Jim Crow and state laws to impose racial segregation. Children working in the Tolar, Hart and Holt Mills in Fayetteville, 1914. Photo by Lewis Hine. Cumberland County's population exploded in the post-World War II years, with its 43% increase in the 1960s the largest in any of North Carolina's 100 counties. Construction was fast-paced as shopping developments and suburban subdivisions began to spread outside the Fayetteville city limits toward Fort Bragg and Pope Air Force Base. The Fayetteville and Cumberland County school systems moved toward integration gradually, beginning in the early 1960s; busing brought about wider-scale student integration in the 1970s. Segregation of public facilities continued. Marches and sit-ins during the Civil Rights Movement, with students from Fayetteville State Teachers College (now Fayetteville State University) at the forefront, led to the end of whites-only service at restaurants and segregated seating in theaters. Blacks and women gained office in significant numbers, from the late 1960s and on into the early 1980s. The Vietnam Era was a time of change in the Fayetteville area. Fort Bragg did not send many large units to Vietnam, but from 1966 to 1970, more than 200,000 soldiers trained at the post before leaving for the war. This buildup stimulated area businesses. Anti-war protests in Fayetteville drew national attention because of Fort Bragg, in a city that generally supported the war. Anti-war groups invited the actress and activist Jane Fonda to Fayetteville to participate in three anti-war events. At this time, Fayetteville also made headlines after Army doctor Jeffrey R. MacDonald murdered his pregnant wife and two daughters in their Ft. Bragg home in 1970; the book and movie Fatal Vision were based on these events. To combat the dispersal of suburbanization, Fayetteville has worked to redevelop its downtown through various revitalization projects; it has attracted large commercial and defense companies such as Purolator, General Dynamics and Wal-Mart Stores and Distribution Center. Development of the Airborne & Special Operations Museum, Fayetteville Area Transportation Museum, Fayetteville Linear Park, and Fayetteville Festival Park, which opened in late 2006, have added regional attractions to the center. In the first decade of the 21st century, the towns and rural areas surrounding Fayetteville had rapid growth. Suburbs such as Hope Mills, Raeford and Spring Lake had increases in population. In 2005, Congress passed the Base Realignment and Closure (BRAC) Act, resulting in several new commands relocating to Fort Bragg. These include the U.S. Army Forces Command (FORSCOM) and U.S. Army Reserve Command, both of which relocated from Fort McPherson in Atlanta. More than 30,000 people were expected to relocate to the area with associated businesses and families. FORSCOM awards over $300 billion in contracts annually. In the November/December 2009 issue of Where to Retire, the magazine named Fayetteville as one of the best places to retire in the United States for military retirements. In December 2015, Fayetteville unveiled the Guinness World Record for the biggest Christmas stocking, weighing approximately 1,600 pounds (730 kg), and measuring 74.5 x 139 inches. Fort Bragg and Pope Army Airfield Field are in the northern part of the city of Fayetteville. Several U.S. Army airborne units are stationed at Fort Bragg, most prominently the XVIII Airborne Corps HQ, the 82nd Airborne Division, the United States Army Special Operations Command, the 1st Special Forces Command (Airborne), and the United States Army John F. Kennedy Special Warfare Center and School. Fort Bragg was the home of the Field Artillery at the onset of World War II. All the Army's artillery units east of the Mississippi River were based at the post, about 5,000 men in all. Soldiers tested the Army's new bantam car, which was soon to be known as the Jeep, although most of the power to move artillery still came from horses and burros. On September 12, 1940, the Army contracted to expand the post, bringing the 9th Infantry Division to Fort Bragg. The mission of Pope Field is to provide airlift to American armed forces and to humanitarian missions flown all over the world. Pope Field particularly provides air transportation for the 82nd Airborne, among other airborne units on Fort Bragg. All of Pope's fighter jet squadrons have been relocated to Moody AFB, Georgia. The main entity at Pope are now the Air Force Reserves, although they still have a small amount of active personnel. In September 2008, Fayetteville annexed 85% of Ft. Bragg, bringing the population of the city to 206,000. Ft. Bragg retains its own police, fire, and EMS services. Fayetteville hopes to attract large retail businesses to the area using the new population figures. Fayetteville becomes the first "Sanctuary for Soldiers". On September 5, 2008, Cumberland County announced it was the "World's First Sanctuary for Soldiers and Their Families"; it marked major roads with blue and white "Sanctuary" signage. Within the county, soldiers were to be provided with local services, ranging from free childcare to job placement for soldiers' spouses. Five hundred volunteers have signed up to watch over military families. They were recruited to offer one-to-one services; member businesses will also offer discounts and preferential treatments. Time magazine recognized Fayetteville for its support of military families and identified it as "America's Most Pro-Military Town". The city limits extend west to the Hoke boundary. It is bordered on the north by the town of Spring Lake. 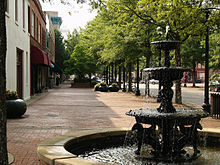 According to the United States Census Bureau, Fayetteville has a total area of 147.7 square miles (382.6 km2), of which 145.8 square miles (377.7 km2) is land and 1.9 square miles (4.8 km2) is water. The total area is 1.926% water. Fayetteville is in the Sandhills of North Carolina, which are between the coastal plain to the southeast and the Piedmont to the northwest. The city is built on the Cape Fear River, a 202-mile-long (325 km) river that originates in Haywood and empties into the Atlantic Ocean. Carver's Falls, measuring 150 feet (46 m) wide and two stories tall, is on Carver Creek, a tributary of the Cape Fear, just northeast of the city limits. Fayetteville is located in the humid subtropical climate (Köppen climate classification Cfa) zone, with mostly moderate temperatures year round. Winters are mild, but can get cool with snow occurring a few days per year. Summers are hot with levels of humidity which can cause spontaneous thunderstorms and rain showers. Temperature records range from −5 °F (−21 °C) on February 13, 1899 to 110 °F (43 °C) on August 21, 1983, which was the highest temperature ever recorded in the State of North Carolina. On April 16, 2011, Fayetteville was struck by an EF3 tornado during North Carolina's largest tornado outbreak. Surrounding areas such as Sanford, Dunn and Raleigh were also affected. There were 78,274 households, out of which 36.7% had children under the age of 18 living with them, 41.3% were headed by married couples living together, 19.5% had a female householder with no husband present, and 34.6% were non-families. 28.7% of all households were made up of individuals, and 7.3% were someone living alone who was 65 years of age or older. The average household size was 2.45, and the average family size was 3.02. In the city the population was spread out with 25.8% under the age of 18, 14.4% from 18 to 24, 28.5% from 25 to 44, 21.5% from 45 to 64, and 9.7% who were 65 years of age or older. The median age was 29.9 years. For every 100 females, there were 93.6 males. For every 100 females age 18 and over, there were 90.5 males. In 2013, the estimated median annual income for a household in the city was $44,924, and the median income for a family was $49,608. Male full-time workers had a median income of $37,371 versus $32,208 for females. The per capita income for the city was $23,362. 18.4% of the population and 16.2% of families were below the poverty line. 27.1% of those under the age of 18 and 9.8% of those 65 and older were living below the poverty line. On September 30, 2005, Fayetteville annexed 27 square miles (70 km2) and 46,000 residents. Some affected residents and developers challenged the annexation in the courts, but were ultimately unsuccessful. The exception was the Gates Four neighborhood which won its case against annexation despite the annexation of all surrounding neighborhoods. Founded in Wade in 1758, Old Bluff Presbyterian Church is one of the oldest churches in the Upper Cape Fear Valley. The fourth Sunday of September each year is the annual Old Bluff Reunion; it is open to the public. Bluff Presbyterian Church maintains a detailed history at its website. Hundreds of houses of worship have been established in and around Cumberland County, including Catholic, Baptist, Pentecostal, Methodist and Presbyterian churches, which have the largest congregations. 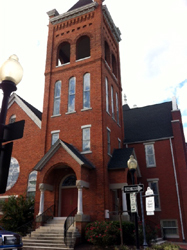 Fayetteville is home to St. Patrick Church, the oldest Catholic parish in the state. Fayetteville is also home to Congregation Beth Israel, formed in 1910 by the Jewish families of Fayetteville. The Masjid Omar ibn Sayyid mosque was named after Omar ibn Said, an African Muslim who was jailed as a fugitive slave and sold in Fayetteville in the 19th century. Visitors to the mosque can find historical information about him and the Muslim community. Additionally, a historical marker to ibn Said was cast along Murchison Road in 2010, the first roadside in North Carolina to recognize a Muslim. Fort Bragg is the backbone of the county's economy. Fort Bragg and Pope Field pump about $4.5 billion a year into the region's economy, making Fayetteville one of the best retail markets in the country. Fayetteville serves as the region's hub for shops, restaurants, services, lodging, health care and entertainment. Fayetteville boasts a low unemployment rate with a large labor pool of trained professionals. The Fayetteville area has a large and growing defense industry and was ranked in the Top 5 Defense Industry Development areas in US for 2008, 2010, 2011 by Expansion Solutions Magazine. Eight of the ten top American defense contractors are located in the area, including Lockheed Martin, Boeing, Northrop Grumman, General Dynamics, and L-3 Communications. The city hosts Partnership for Defense Initiatives (PDI), a non-profit organization that works with government, academia, and private industry to develop defense solutions. The PDI sponsors a Research and Development laboratory and a Defense Security Technology Accelerator (DSTA), a statewide program to assist new companies in developing their businesses and their technology services and products to the entire Department of Defense community. The Cape Fear River Trail is designated as part of the East Coast Greenway, a series of urban trails and greenways that will eventually connect from Maine to Key West, Florida. Cumberland County Schools' headquarters are located in Fayetteville, and the schools serve all cities and towns of the county. CCS operates a total of 87 schools: 53 elementary schools, 16 middle schools, 15 high schools and 9 Alternative and Specialty schools, including 1 year-round classical, 1 evening academy, 1 web academy and 2 special schools. Cumberland County Schools is the fourth-largest school system in the state and 78th-largest in the country. Fayetteville Regional Airport is served by five regional carriers that provide daily and seasonal passenger services to three major airline hubs within the United States. An additional regional carrier and several fixed-base operators offer further services for both passenger and general aviation operations. Landmark Aviation provides fixed-base operator services for passenger and general aviation traffic at the Fayetteville Regional Airport. The general aviation terminal provides a lobby, pilot lounges, a conference room, and a flight room with WSI weather computers. Hangar storage and tie downs are also available. Powell Avionics provides avionics and aircraft radio sales, installation and service. Powell Avionics is a limited fixed-base operator. Rogers Aircraft provides aircraft repairs and maintenance. U.S. 13: The southern terminus of US 13 is in Eastover, at a junction with I-95 and I-295. The Fayetteville Area System of Transit (FAST) serves the Fayetteville and Spring Lake regions, with ten bus routes and two shuttle routes. FAST operates thirteen fixed bus routes within the city of Fayetteville. Service is between the hours of 5:45 am and 10:30 pm on weekdays, with reduced hours on Saturdays and no Sunday service. Most routes begin and end at the Transfer Center at 147 Old Wilmington Road in Fayetteville. Other transfer points are located at University Estates, Cross Creek Mall, Veterans Administration Medical Center, Bunce and Cliffdale Rds and Cape Fear Valley Medical Center. The Atlantic Coast Line Railroad Station, built in 1911, provides daily Amtrak service with northbound and southbound routes leading to points along the East Coast. Henry Evans (circa 1760–1810) built the first Methodist church in Fayetteville in 1793; he is known as the "Father of Methodism" for the area. Doug Brochu, actor in Disney Channel's Sonny with a Chance and So Random! Despite Fayetteville's modest ranking as the 106th largest city in the US, with a population of about 204,000, Fayetteville has earned many top awards and recognition as a desirable location, due to its economic and housing growth as well as its reliance on Fort Bragg. #1 "Job Market in the Country" for recent college graduates, The Daily Beast. #2 "Highest Per Capita Income Growth in North Carolina", surpassing Raleigh and Charlotte, the Bureau of Economic Analysis. #3 "Job Market in the Nation", Manpower, Inc.
#5 "Strongest Housing Market in the US", Bloomberg Businessweek. #7 "America's Strongest Building Markets", Business Week. Top 5 for Defense Industry Development in US for 2010, Expansion Solutions Magazine. #18 "Best Performing City in America", the Milken Institute. ^ a b "Geographic Identifiers: 2010 Demographic Profile Data (G001): Fayetteville city, North Carolina". U.S. Census Bureau, American Factfinder. Retrieved January 5, 2015. ^ "Annual Estimates of the Resident Population: April 1, 2010 to July 1, 2013 (PEPANNRES): North Carolina Incorporated Places". U.S. Census Bureau, American Factfinder. Retrieved January 5, 2015. ^ "Annual Estimates of the Resident Population: April 1, 2010 to July 1, 2013 (GCT-PEPANNRES) - United States -- Metropolitan and Micropolitan Statistical Area". U.S. Census Bureau, American Factfinder. Retrieved January 5, 2015. ^ "City of Fayetteville official website". ^ a b c Encyclopedia of North Carolina, 3rd ed., Vol. 2 (1999), p. 254. ^ "Bell, William (1789-1865) : NC Architects & Builders : NCSU Libraries". ^ "5 Star Towns for Military Retirement" (PDF). Where to Retire. Retrieved 29 August 2015. ^ "At 1,600 Pounds, this is officially the World's Largest Christmas Stocking". FOX News Insider. FOX News. 11 December 2015. Retrieved 12 December 2015. ^ Mims, Bryan (September 16, 2008). "Bragg annexation could boost Fayetteville's retail scene". WRAL. Retrieved April 20, 2012. ^ "Fayetteville Wants You" (PDF). Archived from the original (PDF) on 2011-07-10. Retrieved 2009-03-31. ^ Thornburgh, Nathan (20 November 2008). "Fayetteville: America's Most Pro-Military Town" – via www.time.com. ^ "NowData - NOAA Online Weather Data". National Oceanic and Atmospheric Administration. Retrieved December 4, 2012. ^ "Fayetteville (city) QuickFacts from the US Census Bureau". 7 May 2015. Archived from the original on 7 May 2015. ^ a b c "Profile of General Population and Housing Characteristics: 2010 (DP-1): Fayetteville city, North Carolina". U.S. Census Bureau, American Factfinder. Retrieved January 5, 2015. ^ "Selected Economic Characteristics: 2013 American Community Survey 1-Year Estimates (DP03): Fayetteville city, North Carolina". U.S. Census Bureau, American Factfinder. Retrieved January 5, 2015. ^ "The Bluff Presbyterian Church". Archived from the original on 2007-09-27. ^ "The Bluff Presbyterian Church". Archived from the original on 2007-06-21. ^ "Saudi Aramco World : The Life of Omar ibn Said". archive.aramcoworld.com. Retrieved 2019-02-19. ^ "Marker: I-89". www.ncmarkers.com. Retrieved 2019-02-19. ^ Futch, Michael (October 29, 2010). "A slave and scholar, Omar Ibn Said led an exceptional life". Fayetteville Observer. ^ "Community Facts > FACVB". Archived from the original on 2015-05-02. Retrieved 2015-04-28. ^ "Top 5 Defense Awards 2011". Expansion Solutions Magazine. Cornett Publishing Co., Inc. Retrieved 19 January 2018. ^ "PDI Research & Development Lab - Mission Statement - North Carolina". Archived from the original on 2013-04-15. ^ "Woman's Club of Fayetteville -". ^ "Home - The Arts Council". ^ "Fayetteville Museum of Art - Home page". ^ "Cameo Art House Theater - Home page". ^ "Berean Baptist Academy - Fayetteville, NC". www.bbafnc.org. Retrieved 2018-02-17. ^ "North Carolina's Rail Division with AMTRAK Service". bytrain.org. ^ Staxrecords.free.fr Profile, staxrecords.free.fr; retrieved May 23, 2007. ^ Jacobs, Chick (2012-12-28). "Former mayor Beth Dail Finch recalled as 'gentle,' 'strong'". Fayetteville Observer. Retrieved 2013-01-08. ^ "Best Cities for Recent Grads". 31 May 2011. ^ "Bureau of Economic Analysis Per Capita Incomes" (PDF). Archived from the original (PDF) on 2017-05-02. Retrieved 2018-12-31. ^ WRAL (8 December 2009). "Jobs picture brightens a bit in Triangle, is strong in Fayetteville :: WRAL.com". ^ "Expansion Solutions Magazine - 011_AwardsDefense". ^ Greenberg, Peter. "Newsmax Magazine Rates the Top 25 Most Uniquely American Cities And Towns". Retrieved 13 January 2014. ^ webdemar. "Press Coverage - Sanctuary Press Room". Archived from the original on 2013-05-18. Retrieved 2013-09-24. ^ "Interactive City Directory". Sister Cities International. Archived from the original on 2015-04-02. Retrieved 17 March 2015. Baca, George. Conjuring Crisis: Racism and Civil Rights in a Southern Military City (Rutgers University Press; 2010) 196 pages. An ethnographic study of urban politics and racial tensions in Fort Bragg and Fayetteville. Fenn, Elizabeth A.; Watson, Harry L.; Nathans, Sydney; Clayton, Thomas H.; Wood, Peter H. (2003). Joe A. Mobley (ed.). The Way We Lived in North Carolina. The University of North Carolina Press. Meyer, Duane (2007). The Highland Scots of North Carolina, 1732–1776. The University of Matthew Burris. Oates, John (1981). The story of Fayetteville and the upper Cape Fear. Fayetteville Woman's Club. Wikimedia Commons has media related to Fayetteville, North Carolina.